Silver Touch Technologies UK LTD is going to participate in the largest B2B event of the United Kingdom and Europe – The Business Show 2019. As a global SAP partner and a leading provider of ERP solutions, our company has successfully delivered 125+ SAP projects worldwide. As an exhibitor at The Business Show 2019, Silver Touch Technologies will focus on sharing insights and experiences in the domains of business management solutions, digital transformation and asset creation, and emerging technologies like SAP Business One with reputed business persons and entrepreneurs of Europe. Do you want to get the benefits of advanced ERP and business management solutions? Do you want to know what technological advancements can do to take your business to the next level? 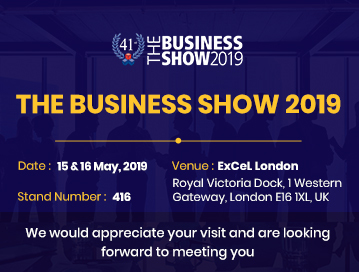 Just visit our Stand Number 416 at The Business Show 2019 between May 15 and 16, 2019 to get answers to all your questions. Our delegates will happy to guide you through the management of key business processes with advanced IT solutions. Regarded as the biggest business event in Europe, The Business Show 2019 is about bringing startups, SMEs, and established corporations under one roof. Keynote speakers will mention the features and opportunities for modern business. This largest B2B event of UK is organized for two days- May 15 and 16, 2019. It is indeed a great platform for entrepreneurs and businesspersons who want to thrive amid a highly competitive business scenario.